So much is done electronically these days. With a swipe of the finger or a click of a button I can check my bank activity, deposit a check, buy movie tickets, and make reservations for a much-needed dinner date with my wife at our favorite restaurant. BAM! It’s done! We are a society on the go. 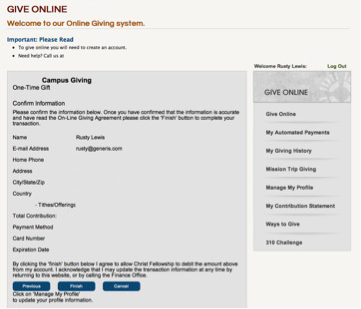 We opt for quick and easy solutions, and a church’s online giving system is one more way we can provide that quick and easy solution for what generous givers desire. 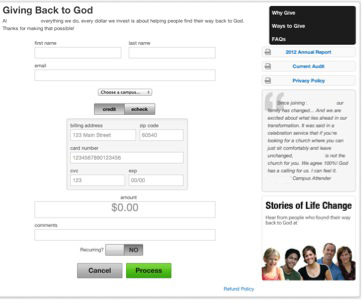 From the homepage of the church’s website, you click on the “giving” link. This is the first and only page that one must complete to make a gift. You can tell at first glance that this is a simple process, can’t you? All on one page, you enter your contact information and the amount of your gift. Note that this example doesn’t require an account to give online. It enables people to make a one-time gift. 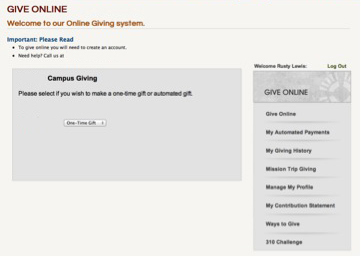 Generous people look for convenient ways to give to non-profit organizations. 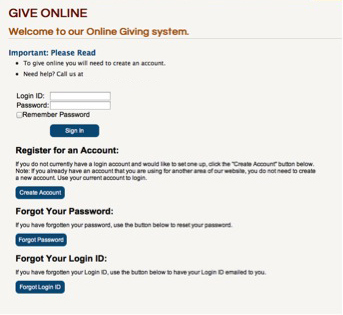 With 1.2 million charities in the United States alone, having a complex and cumbersome online giving system is actually standing in your way of being their organization of choice. 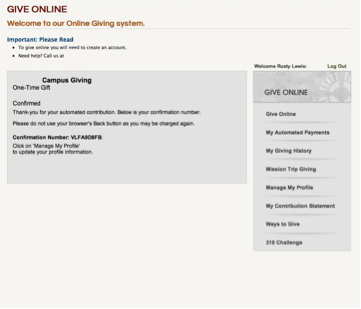 Online giving has grown almost 5% in the last year, according to a press release from Blackbaud. 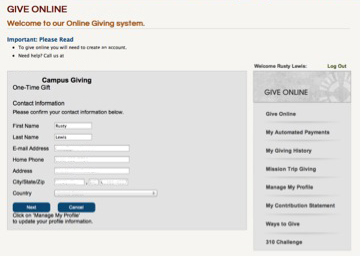 They also note that small organizations experienced the largest increase in online giving. 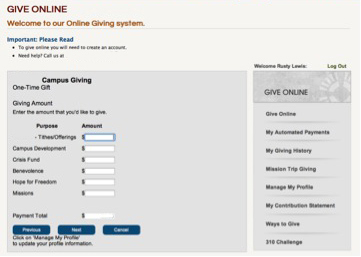 If you don’t offer online giving, then you are simply not keeping up with the trend and may be losing out as a result. 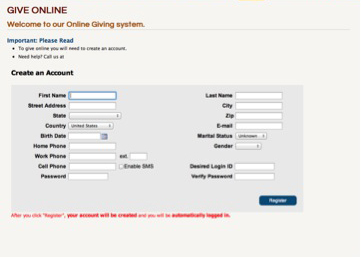 If you currently provide an online giving system that requires an account before someone can give, you are creating hurdles for generous people to provide a gift to your church. And they will likely opt out. For every additional page you make people click through, you are providing them that same number of off ramps as they become frustrated with the process. And they will likely opt out. The younger generation doesn’t typically carry cash or checks. They carry debit cards that are tied to their bank accounts just like their checks are, and they carry cards because it’s easy. When the offering plate is passed and they don’t have cash or check, you have made it difficult for them to participate in the offering. They desire a simple solution. Did you make it? Did you scroll all the way down? If you’re reading this, then you did! That’s a lot to scroll through and read, let alone to ask a giver to provide all the information required. 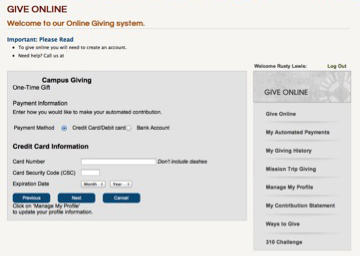 Although this is an extreme example, I hope this serves as an illustration for the need to create easy-to-navigate, simple-to-operate online giving systems. Next I will explore what should happen after the giver clicks the submit button. What should appear in their inbox and what should they see next on their screen?